Let us try some linear models, starting with multiple regression and analysis of covariance models, and then moving on to models using regression splines. In this section I will use the data read in Section 3, so make sure the fpe data frame is attached to your current session. Note first that lm is a function, and we assign the result to an object that we choose to call lmfit (for linear model fit). This stores the results of the fit for later examination. A nice feature of R is that it lets you create interactions between categorical variables, between categorical and continuous variables, and even between numeric variables (it just creates the cross-product). Let us look at the results of the fit. One thing you can do with lmfit, as you can with any R object, is print it. (Intercept) -14.4511     7.0938  -2.037 0.057516 . 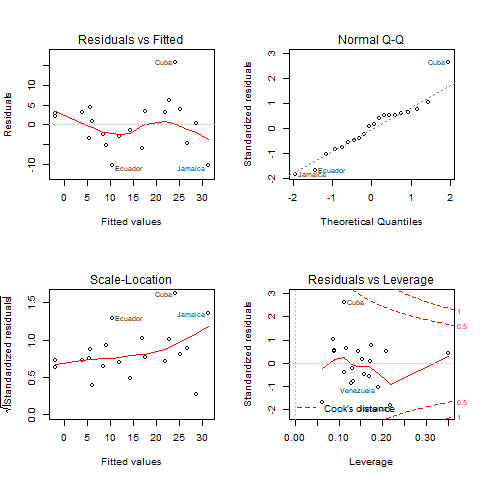 This will produce a set of four plots: residuals versus fitted values, a Q-Q plot of standardized residuals, a scale-location plot (square roots of standardized residuals versus fitted values, and a plot of residuals versus leverage that adds bands corresponding to Cook's distances of 0.5 and 1. R will prompt you to click on the graph window or press Enter before showing each plot, but we can do better. Type par(mfrow=c(2,2)) to set your graphics window to show four plots at once, in a layout with 2 rows and 2 columns. Then redo the graph using plot(lmfit). To go back to a single graph per window use par(mfrow=c(1,1)). There are many other ways to customize your graphs by setting high-level parameters, type ?par to learn more. Technical Note: You may have noticed that we have used the function plot with all kinds of arguments: one or two variables, a data frame, and now a linear model fit. In R jargon plot is a generic function. It checks for the kind of object that you are plotting and then calls the appropriate (more specialized) function to do the work. There are actually many plot functions in R, including plot.data.frame and plot.lm. For most purposes the generic function will do the right thing and you don't need to be concerned about its inner workings. which lists the named components of a linear fit. All of these objects may be extracted using the $ operator. However, whenever there is a special extractor function you are encouraged to use it.